New on display card. Pedestrians on the path seem to automatically move when hearing a bell - voices take time to understand. No effort - just ring your bell - and you are on your way. 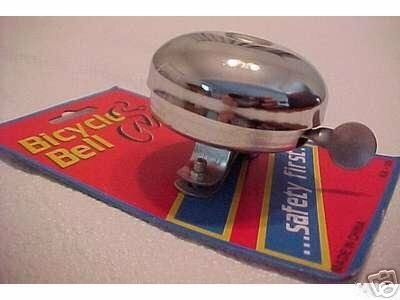 This is an all metal dome bell (2 1/4" diameter) with all metal mounting bracket and hardware (for handle-bar mounting). Plastic bells break too easily. S&H in the contiguous USA is $1.50 (insured shipping).Please see other interesting products by JGrit.USPS DELIVERY TIME: As stated in the item listing, seller will drop-off your item to the USPS within 4 days of receiving cleared payment. How long it takes to deliver to your door is strictly within USPS control and not within the control of seller. Please leave 5 stars for seller 4 day drop-off time. Thankyou.